District income tax forms offer taxpayers three ways to contribute to causes important to the District. These include funds that pay for the Statehood Delegation, cleanup of the Anacostia River, or programs for drug use prevention, especially for the youth. We look at the District tax data to figure out who gives to these funds. In 2013, 3,715 District taxpayers contributed $136,000 to these three causes. The average contribution amount was $37, but most people gave in the $5 to $10 range, and only a handful of people gave in $100s. The biggest contribution was under $2,000. People tend to contribute if they are due a refund–the contributions come out of their refunds. Very few people who owed taxes at the time of filing contributed. The Anacostia Cleanup Fund had the largest take with $60,000 from 2,677 taxpayers. Moreover, most who contributed live by the river. Drug Prevention fund took in $49,000 from nearly 2,000 taxpayers and Statehood delegation fund took in $27,000 from about 1,740 taxpayers. The bulk of the contributions came from taxpayers with incomes between $35,000 and $135,000. 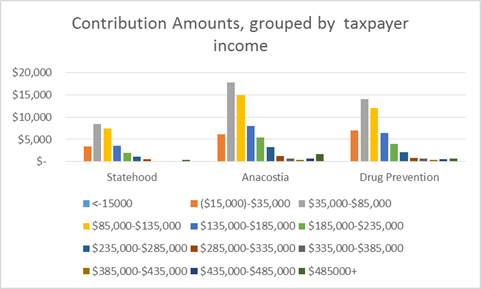 Taxpayers with incomes under $135,000 were the source of 80 percent of contributions for the Statehood Delegation Fund, and roughly 78 percent of the contributions for the Anacostia Cleanup and Drug prevention funds. It is hard to say why higher income residents are not giving more. It could be perhaps they give to other causes, or because they typically do not have any refunds they could use towards these fund. Next > How $200k Can Seem Middle-Income in D.C. This matches my behavior. I didn’t contribute the year I owed money, but the subsequent year when I was getting a refund, I contributed. I might contribute more if I had more information about the contribution recipients.